Calendula Cream’s light texture is both soothing and moisturizing. It is ideal for use on dry or chafed skin. Try it as a night cream or after exfoliation or cleansing treatments. For scrapes, skin irritations and sunburn, first cleanse the area with mild soap, rinse and dry. Then apply a thin layer of Calendula Cream to affected area 3 times a day or as needed. Do not use if you are allergic to Calendula officinalis or to any of this product’s inactive ingredients. Ask a doctor before use in case of deep or puncture wounds, animal bites or serious burns. 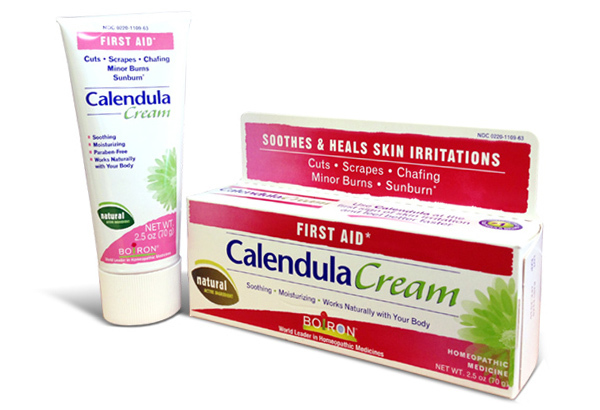 Calendula Cream is available in a 2.5 oz tube. At Boiron, we believe there’s more than one way to feel better. Since 1932, the Boiron family has been committed to providing quality medicines. As world leader in homeopathy, our passion is your health. Our promise is your satisfaction. Find out more at www.boironusa.com. © 2019 Boiron®, All Rights Reserved.